I've spent much of the last ten years in the South Caucasus, Eastern Europe, and elsewhere - teaching international relations and working as a journalist. In 2004, I taught US foreign policy and Cold War history at Baku State University and Baku Slavic University in Azerbaijan as a CEP Visiting Faculty Fellow. In 2009, I taught at GIPA, the Georgia Institute for Public Affairs, in Tbilisi. I've also been an adjunct lecturer at universities and colleges in the US. My MA in international relations is from the University of Chicago, where I focused on strategic studies and US foreign policy. 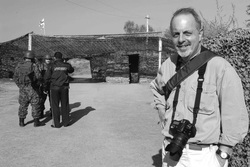 My work as a journalist has included a long stretch as the South Caucasus correspondent for ISN Security Watch (run by the Center for Security Studies in Zurich), as well as blogging for the Foreign Policy Association and writing Op-Eds for publications such as the Vancouver Sun and PostGlobal, the Washington Post's global affairs site. Over the past decade, I've covered conflict, attempted revolutions, and human rights issues from all over the South Caucasus as well as Ukraine and Macedonia. My academic work has focused on twentieth century history and conflict, and my latest article--on renewed fighting between Armenia and Azerbaijan in the Nagorno-Karabakh area--was published in April of 2016 by The National Interest. I've been interviewed as a regional expert by the Canadian Broadcasting Corporation, Voice of America, Turan News Agency, and other outlets. As a short- and long-term election observer for the OSCE, I've been on missions to Ukraine, Albania, Armenia, Belarus, and Macedonia. In 2014, I was a long-term observer for Democracy International during the Afghan presidential election campaign. This was my fourth such trip to Afghanistan since 2010. I'm a member of the Frontline Freelance Register (London) and am available for short- or long-term assignments in journalism, analysis, and photography virtually anywhere. By navigating this site, you can find links to or copies of many of my articles as well as samples of some of my photographs from the South Caucasus and beyond. You can reach me at krahder at uchicago dot edu.